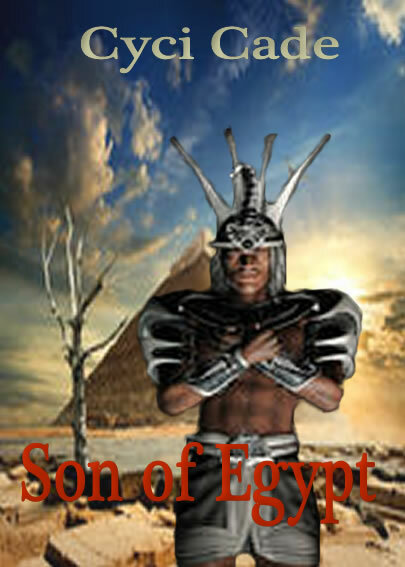 I keep studying the hieroglyphs while Anhuren walks to the other side of Osiris´ temple. In a picture there´s a bearded man with a dark skin and a crown—he is holding a flail—many objects are around him and women are with their hands extended to him. “Osiris,” I whisper. In another picture, there´s a man crouched in front of Osiris, who is seated holding a flail and crook in front of his chest, another man is behind Osiris with his hands extended toward him. There is also an eye-shaped figure. Is this the Eye of Horus? Anhuren is right, this is the place, I conclude. Curiosity possesses me. I wish I had my mother´s book in my hands right now. I start to understand her passion; these myths are incredible, I wonder if these people existed or they are just legends. Well, Anhuren is real, as well his power. I´ve seen it, I´ve experienced it. Therefore, all of this is real too, I assume. As I turn to the sides to look for the embodiment of the god of war, chills run up and down through my spine, making the hair of the nape of my neck stand on end. It spreads through my body, I rub my arms. “Anhuren?” I yell and move forward trying to escape from the cold. They are here. I sense the shadows. A dim light comes from the corner of the temple, I follow the light. It´s shine is diminishing. I speed up, it´s dark behind me. The shadows are pursuing me. “Adele!” Anhuren´s voice echoes in the temple confusing me. I don´t know where he is, the dim light isn´t him. “Anhuren?” I call back. In the opposite side of the temple, there´s what looks like a tomb twice the size of Anhuren´s tomb. It´s gold, tall, and water surrounds it. A man is next to it. My legs fail as I move toward him. Only next to him I recognize Anhuren, he is different, his image is distorted. Keeping a safe distance, I scrutinize him. Anhuren seems in trance with his hands extended to the tomb, his eyes are open but he doesn´t see anything in front of him, I assume. Anhuren opens his mouth and starts to chant in my language. This is the first time he chants in English. Does he want me to understand his words? Anhuren throws his arms back puffing his chest, his head drops back. A blue pulsating light appears in the middle of his chest and spreads through his body. Anhuren screams when the light leaves his body. I cover my mouth with both hands in order not to scream either. Is it painful? Will it kill him? I just see the blue light that seems to consume his body. I shudder. Shadows embrace me in a tight hug. They are everywhere, they are like hands holding me. Soon, I´m gasping for air as if the shadows are consuming my insides. “Anhuren!” I scream. He continues in trance. I veer to the sides, trying to release myself. They are strong. I move my arm to reach an arrow, as I grasp it, the arrow shines in my hand. I hold it in front of my body. I wave the arrow to the sides as if it is a torch, it works. It seems to intimidate the shadows but doesn´t stop them. The shadows pass by and move toward Anhuren, he is the target. Anhuren has the blue stone in his palms, he is chanting in his strange language, unaware of what is happening. Ignoring my voice and the shadows, he walks forward stepping in the water that surrounds the tomb. The shadows approach him. I grasp my bow and prepare an arrow. I rush toward him shooting an arrow after another in a frantic way, trying to prevent the shadows from taking him. Anhuren leans his hands on the top of the tomb, the blue light dwindles to nothing. Shadows fall over Anhuren and the temple. I just feel… cold. I turn to sides, moans and awful screams echo in the temple. My heart beats in my throat. What happens now? Is this the end? I sense a weight in my chest, it´s painful. Is this hell? The awful screams of pain become louder. I´d be screaming at the tops of my lungs too if I wasn´t paralyzed by fear. I´m motionless, I can´t do anything. Right away, there´s an explosion. A wave of light passes by me—or through me—I don´t know. It spreads through the temple, consuming the shadows. Those awful screams belonged to the shadows. Anhuren´s body shines. He steps out of the water and walks a few feet toward me. He made it! He returned the Eye to its place. Osiris will protect the Eye from now on. He defeated the shadows. When he stops shining and his eyes meet mine, I rush toward him. I launch myself in his arms. Before he has time to react, I touch my lips to his. I´m not sure what I´m doing because this is the second time I kiss a man. Well, this is the first time. According to Anhuren, he didn´t kiss me in the museum. I move my lips with urgency because I fear the moment he will push me back and stop the kiss. I move my head to one side and then the other, trying to taste each part of his mouth. I move my lips wildly and then softly, trying to discover the best way to kiss a man. When I´m satisfied, I part our lips. “This is a kiss,” I say, looking straight in his eyes. “No, this is a kiss.” He leans forward, his mouth covers mine, and… well, this is a kiss.